(Phys.org) —More than 12 billion years ago a star exploded, ripping itself apart and blasting its remains outward in twin jets at nearly the speed of light. At its death it glowed so brightly that it outshone its entire galaxy by a million times. This brilliant flash traveled across space for 12.7 billion years to a planet that hadn't even existed at the time of the explosion - our Earth. By analyzing this light, astronomers learned about a galaxy that was otherwise too small, faint and far away for even the Hubble Space Telescope to see. "This star lived at a very interesting time, the so-called dark ages just a billion years after the Big Bang," says lead author Ryan Chornock of the Harvard-Smithsonian Center for Astrophysics (CfA). "In a sense, we're forensic scientists investigating the death of a star and the life of a galaxy in the earliest phases of cosmic time," he adds. 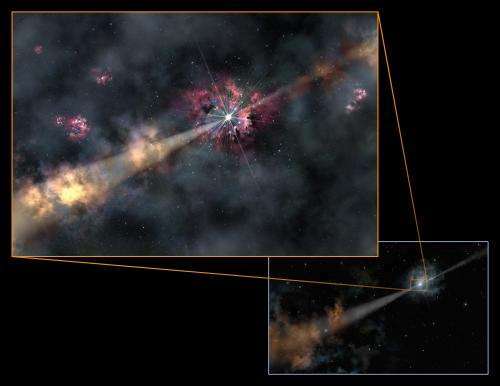 The star announced its death with a flash of gamma rays, an event known as a gamma-ray burst (GRB). GRB 130606A was classified as a long GRB since the burst lasted for more than four minutes. It was detected by NASA's Swift spacecraft on June 6th. Chornock and his team quickly organized follow-up observations by the MMT Telescope in Arizona and the Gemini North telescope in Hawaii. "We were able to get right on target in a matter of hours," Chornock says. "That speed was crucial in detecting and studying the afterglow." A GRB afterglow occurs when jets from the burst slam into surrounding gas, sweeping that material up like a snowplow, heating it, and causing it to glow. As the afterglow's light travels through the dead star's host galaxy, it passes through clouds of interstellar gas. Chemical elements within those clouds absorb light at certain wavelengths, leaving "fingerprints." By splitting the light into a rainbow spectrum, astronomers can study those fingerprints and learn what gases the distant galaxy contained. All chemical elements heavier than hydrogen, helium, and lithium had to be created by stars. As a result those heavy elements, which astronomers collectively call "metals," took time to accumulate. Life could not have existed in the early universe because the elements of life, including carbon and oxygen, did not exist. Chornock and his colleagues found that the GRB galaxy contained only about one-tenth of the metals in our solar system. Theory suggests that although rocky planets might have been able to form, life probably could not thrive yet. "At the time this star died, the universe was still getting ready for life. It didn't have life yet, but was building the required elements," says Chornock. At a redshift of 5.9, or a distance of 12.7 billion light-years, GRB 130606A is one of the most distant gamma-ray bursts ever found. "In the future we will be able to find and exploit even more distant GRBs with the planned Giant Magellan Telescope," says Edo Berger of the CfA, a co-author on the publication. More information: The team's results will be published in the Sept. 1 issue of The Astrophysical Journal and are available online. How accurate can that "signature" be when there is so much confusion about the plasma that pervades the universe. Many of the current theories based upon the "ideal gases" of space were developed when it was believed to be the inert "vacuum of space", we now know plasma pervades the universe. Therefore, any and all theories based upon "ideal gas laws" to describe space are useless and baseless and lead to erroneous conclusions and don't paint an accurate picture of that compares to observation. Perhaps you are the only one who is confused by "the plasma that pervades the universe"? Or perhaps you are mistaken that people are confused about "the plasma that pervades the universe? You are certainly the only person I've ever read who talked about "the inert "vacuum of space"" as if it were true. Regardless, it is clear to everyone you are confused. Have you ever met Oliver? If he were here, he could straighten you out, I'll bet, oh boy!. Or not. How accurate can that "signature" be when there is so much confusion about the plasma that pervades the universe. Spectral lines are produced by recombination in plasma, that is how it produces light. The wavelengths are determined by the element and properties like the line width and detailed structure by macroscopic effects like temperature, pressure and magnetic field strength. Me too, Jean's instability for example. A process observed in star forming regions everywhere, try again.